Parents,siblings,beloved,friends, the society as a whole.. Someone always had something to say when they would see my hair a little longer than usual and instigate me to change my mind. How long will I keep them? Till my learning is over.till I am sure, I will follow religiously what i have learnt from my guru. Learn?? !! You kidding me? ?You got a guru who asked you to grow hair? You learnt? ?What did you learn growing your hair this long? Patience-it takes a lot of it while drying them rubbing with the towel everyday after taking a bath and then untangling them with comb.And I find,I am being more patient toward everyone and everything,rather than reacting in anger or frustration.Helps developing relationship. Control on Anger- trust me!anger exploded initially, after I would come out from bath.5 mins and above rubbing the towel on my head and then combing the hair for good 10 mins to untangle.Choice was simple- either I quit or do this everyday.I chose the second and once I stopped being frustrated and angry,I started taking lesser time drying my hair and then untangling and combing them.Slowly,I applied controlling anger with people around and rather apply brains and get things done faster.It works miracles. Concentration– that’s something I learnt only recently.Taming your wet hair everyday from drying them to slowly untangling and then back-brushing takes 100 percent concentration.You just cannot do without it if you really want to save time and peace of mind and bit of knotted-hair which you would ideally intend plucking off,every time you comb.I somehow,noticed I have developed the ability to concentrate at whatever I am doing any given moment.This is giving me better output everywhere. Discipline-I am lot more disciplined now.No more getting ready in haste.I know my hair would take time hence I pre-schedule my bathing time and accordingly everything else.Slowly, I have realized I love being disciplined , on time, and proper. With long hair,you just cannot take things casual.No more,just a boy who can put a pair of jeans and t-shirt on and spray the deodorant around put the shoes on and leave,anytime! Self Respect-I respect myself for being able to do what I always wanted to despite unhealthy criticisms. It means I can do bigger and better things whenever I want to.And now,I know how to do so. Sky is the limit. Respect for others– I don’t make fun of people who have differently trimmed beard or hairstyle or have nose or lips pierced or tattooed,anymore.I learnt,they had the guts to break unwanted social rules which seem to have restricted ‘gentleman-ship’ in attire and accessories.But its within.Shirt and Trousers,short haircut or pierced ears and tattooed hands don’t define how gentle or wild a man is. These are just: statement of lifestyle-my life my style. Haha, this deserves a place in Cosmo hall of fame! I wonder why we women are conceited and not evolved about our hair- the world would be a better place if we did! Haha:) But how U handle the summer with such burden over ur head? wow .. this is one amazing song 🙂 is this any album ?? Pata nahi tere jaise nanhi jaan ne kitne zulm sahi iss duniya se bas baal badhane ke khatir…Jai ho JACK ji aur aapke GURU ji..
tu to mujhe replace karliya hai blogging ki duniya mei .. hahaha..jaha jata hu tere comments mujhse pehle hote hain !! hahaha..
Arey yaar kya karu …Office mein bhi kaam nahi rehta hai na…tympass karte rehta hun…. Yehi dosti yehi pyaar,tune mere blog ko abhi tak follow nahi kya yaar…. Wah Wah Shayari ban gaye…Follow karo na mere blog ko Please…. I follow you anyways dost !! I have had issues with my mailbox.I loose important mails to spam because of lack of space. It will get resolved in sometime.I surely will. 🙂 Anyways , it does not matter.. I open yoursite every day to see what is new 🙂 still.. if you like it that way my friend .. I will do it the moment my mail issue is resolved. Along with Nitesh’s post, I don’t miss to read yours and Vijay’s comments…they make me split my sides laughing! what? the long hair ?? hehhe I will 😀 thanks for dropping by !! And not only that, with the guru sitting on your head, you yourself can also become a guru now. thats the magic you dint need to find or do anything.. lessons will start and by the time you finish the last semester you would know life has completed a session already with u 🙂 Trust me ! Haha Mysay….Long hair baba ki jai ho…and Jai ho to your creativity!!!!!!!!!!!! More than your long hair, it’s the thoughts that you’ve shared that’s inspired me. I am overwhelmed , thankful and glad .. its an honour to be complimented that big.. I wish I were a Guru 🙂 hehe .. its a great business these days , ain’t it ? A must read for all those with either short or long hair. Some deep insights in there. All said and done, I now know that long hair make one an ace writer. Your beautiful write is testimony to what I say. hahahaha !! Vijay Ji aap lage raho .. mera therapy apke saath hai 🙂 Castor Oil with coconut every night !! Ha ha ha Hope your Guruji become long and long and longer. . .
With due respect … cheers to the feeling which did not shook under social pressure and evolved like a true hero …. I wanted to share this… You growing ur hair and wearing it long was good so far it pleases u and by Gawd u sure have learnt lots. U know i have very short hair like boys and when i did away with my tresses it was known as the pageboy cut. i’ve had it for so many years now that i have forgotten my long hair look completely. My reasons were simpler than urs though. 1) something to keep it simple and tangle+maintenance free. 2) i would never have a bad hair day. But but but i sure do miss wearing that single piece of jewellery i love the most. i don’t know what they call them in English but in Hindi it is called Maangteeka…you know the small chain with a pendant that hangs on the forehead. Somehow it looks pathetic with pageboy cut. Seriously…grow them long or cut them short…The hair does teach us something…all the time. Yes indeed Maangteeka looks best in long hair .. but then everything has pros and cons .. aint it ? Hey this is such a great post – its more than about hair and styles – your personality just shines thru = silky straight ! ( I never was able to tame my mane as ppl call it ) the few times I tried salon, it stayed straightened for 5 mins. Then it went back to wild wavy – okayee.. how long is this guru… MySay, post us a pic ? LOLZ. Your guru must be definitely proud of you. 🙂 Never thought growing long hari teach u so many things 🙂 Good Post Mate. Cheers. Now you know why women (at least the ones with long hair) are more patient, disciplined….etc. Didn’t your Guru tell you this? Thank you ma’m for dropping by ma’m and expressing your views. 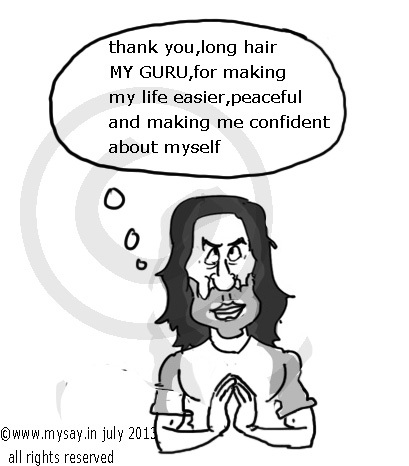 I have never read long hair to be a guru. You have learned a lot from this guru and i am glad you passed on some of it to us. Good things are worth learning from from anyone . Ain’t it Sir ? kya Baat hai Jack.. 🙂 aapke guruji kaun sa hair oil use karte hain? Hehe…a very different post than your usual ones..I mean less of doodle speaking this time 🙂 but I am really amazed how beautifully you have comprehended and have come up with such an innovative post out of a really simple concept..your Long Hair! Kudos!! i think it is time to show your face with your looong locks ! Now I know why all the learned men of ancient India had long hairs…. 😀 :D….I am showing it to all the aunties out here so that they allow their young grasshoppers to grow the hair…..
holy cow!! with such an able “Guru” who needs any more….!! A big whistle for this one!! hahaha !! Onek hair-loss hocche .. Ki korbo kono idea de ! 🙂 thanks friend !! overwhelmed ! well… I should thank you for thinking on same lines 🙂 . Long hair mustache and/or beard is ethnic and the definition of true Indian men before being slaves to the East India Company. I choose to be ethnic 🙂 I choose not to be a mental slave to the West anymore. We are suffering from identity crises … aint we ? hehehe I can write on and on 😀 on this .. about the way we are still slaves to what west considers right. I totally agree with you. I had grown my hair for a good 1 year and received mixed criticism. Some liked it some didn’t. One thing that I realized is that, though I am not attractive but my hair drew a lot of attraction. While reading through your post I realized that each and every thing we do teaches us. And it’s not only hair but anything that you do will inspire you. Every one has ideas to do something different but either they never begin or they never finish. Odds will always be there when you begin, people around you oppose you, crticise you, call you crazy, but when you succeed the same people follow you. you got to trust yourself blindly to win. This is what draws the line between a common man and a hero. First visit to your blog from IndiBlogger and I’m really impressed yaar! Picking out so many positive lessons from own long hair is really something unique! I’m inspired! I sent you an Email. Please check when you get time.